Last month, I reviewed the two BBGuns singles, "Dreamcast and "Willow". I was excited about the album that was promised to follow. Well, today, Valentines Day, is the official release. Thirst goes out to all the lonely hearts out there. That includes me too. 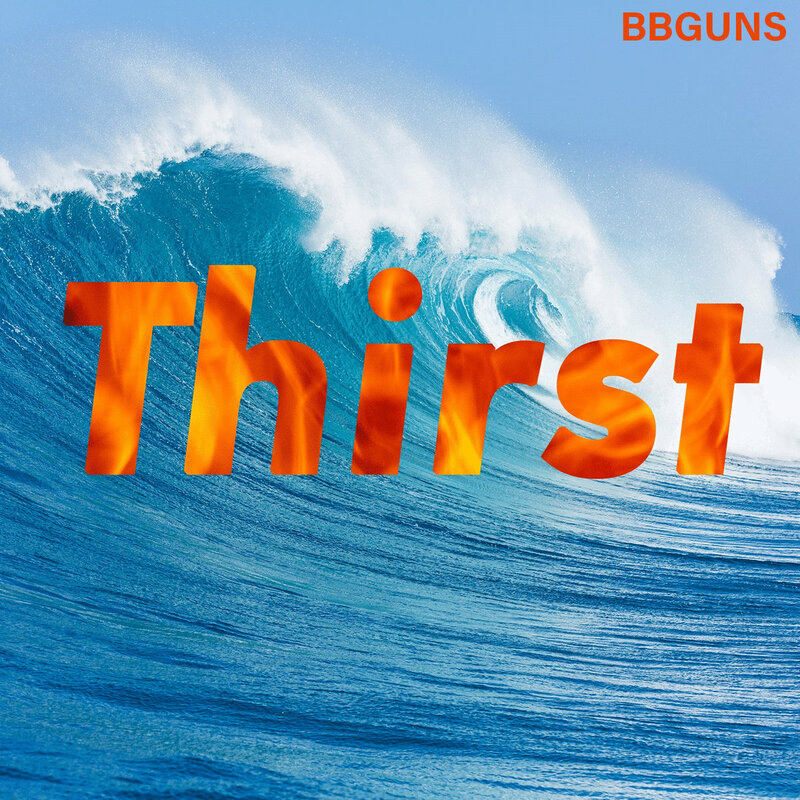 I like the album cover for Thirst. I am not super big on the way "BBGuns" is displayed on it; it's a really basic Ariel-type font. It also works with the rest of the composition though, and that's what's most important. The flames in the text remind me of the Jesus Lizard's Goat. The wave is so smooth and nice looking. Of course, it contrasts with the fire. It's a very clean design, very modern, and very true to what's being told here. The first track, "Mauve", comes in hard. Barz Blackman has some hot raps contrasted with Lazy JP's drawn-out singing style. I like the short dream-pop sounds and the snare. JP's verse at the end seals the deal. "Circles [It's Time]" has a dance thing going on, and it comes in with a more techno sound. I like how this song changes as it moves ahead. It's such a different song by the end, vocals sorting through a cyber-drone-wall. There's a beautiful melody too. The only thing I'm not really fond of is the line, "and everything is so purple". Next is "Willow", which I've reviewed before. I'm not gonna review it again. "Lost Soul" has a swinging jazz cool. There's some rapid-fire rapping before Barz launches into something that could be on a Digable Planets record with some cool rhymes. "Ensure my first born's rich," and the subsequent rhymes are the real thing. "Drive" is somewhat too bright. It features Mrs. Paintbrush (aka Jackson from Grand Buffet). I don't dislike it, though it is a bit long. "PK Starstorm", named for a PSI ability in the SNES game Earthbound, opens with a verse from JP about love letters and romantic failures. The subsequent verse, presented by Barz, presents the anxiety of our modern age in terms of love. The next song, "William", makes me sad with the line "she studied psych and nursing, but now she's moving coffee," and then the subsequent verses about how the connection didn't work. The whole song is full of Romeo & Juliet references, which are cheesy but work. It's so obvious that it works perfectly here. The latter part of the song contains some of the coolest drone sounds I have heard. The opening of "Blade Runner" sets the scene, rainy and mysterious. Unfortunately, this one is also kind of bright, and I am not fond of the repeating voice sample in the chorus. The song is too repetitive. Some stuff shines thru the gloom though - the sample I initially disliked works better towards the end, and the last verse by Walkman is a fresh sound. I'm not fond of the chorus of "Ghost in the Shell," as it seems too obvious the way it repeats the title. The song is good though. The floating keyboards and rattling bells are very atmospheric. "Disguises" is about changing who you are to meet different expectations. It is creepy to think about, though it happens all the time every day. To quote Captain America/Wyatt in Easy Rider, "I never wanted to be anybody else." Track 11, "YELNATS", has possibly a Pepsi commercial sample within it? I don't know what it is, but I love the little vocal blips scattered about. Everything about this song is catchy. The penultimate track is "Dreamcast", an awesome song that I have already reviewed. The final track is "555". I love the muffled keyboards on this one. "I don't wanna die, but I don't wanna live another lie." For how epic the album is, this last song ends very abruptly. It kind of works with the theme of the last song and the album, the doom and gloom of modern romance, to put it in a melodramatic way. It's still weird though. Thirst is the tale of internet dating in the time of Tindr and OkCupid and hookups and all of that stuff. I think a lot of people are more alone now than ever; the internet is a great communication tool, but it also helps keep us indoors and looking away. There is also economic and political despair for young people today, failed promises and a questionable future. In a sense, BBGuns have kind of continued the gangsta rap of the early 1990s with these stories of heartbreak on a societal failure. In addition to the epic scope, Thirst is full of catchy hooks, exciting and unusual backing tracks, and powerful rapping. Barz goes hard with such fury, and JP's parts will get stuck in yr head. They are definitely stuck in mine right now. Though I feel that the best tracks were definitely the singles, Thirst still has a lot to offer and thus receives a Good.